Research Triangle Park, the largest planned research center in the United States, was created in 1959 through the efforts of Governor Luther Hodges and hundreds of scientists, politicians, and business leaders. Located between Raleigh and Durham and the Triangle's three acclaimed universities-the University of North Carolina at Chapel Hill, Duke University, and North Carolina State University-Research Triangle Park (RTP) in 2006 encompassed 7,000 acres and was home to more than 100 research and development organizations employing 38,000 North Carolinians. Smaller but highly successful research parks also existed in Charlotte, Greensboro, Rocky Mount, and elsewhere, playing an important role in the diversification of the state's economy. The need for a redirection of economic development away from traditional products such as textiles, tobacco, and furniture was envisioned in the early 1950s by some of North Carolina's more progressive leaders. In 1952 Howard Odum, a renowned UNC-Chapel Hill sociologist and founder of the university's Institute for Research in Social Science, voiced a number of ideas about cooperative research centers that could benefit the state by combining the strengths of its three research universities. State leaders considered how these institutions could become a foundation for economic development. In the mid-1950s Greensboro construction company executive Romeo Guest, state treasurer Brandon P. Hodges (no relation to Governor Hodges), and Walter Harper of the State Board of Conservation and Development were recruiting industry to North Carolina from other states. Guest, who had studied at the Massachusetts Institute of Technology, had seen firsthand the growth of university-related industry along Boston's Route 128. Hoping that the phenomenon could be duplicated in North Carolina, Guest coined the term "Research Triangle" after noticing the triangular relationship on a map of Chapel Hill, Durham, and Raleigh. He discussed the idea with business and academic leaders around the state throughout 1954. Prominent among the business leaders was Robert M. Hanes, president of Wachovia Bank. The group decided that government participation would be needed, and members approached Governor Hodges. Over time, Hodges agreed with the concept and soon became one of its strongest proponents. In September 1956 the Research Triangle Committee (changed in 1958 to the Research Triangle Foundation) was formally incorporated. Members included Hodges in his capacity as chairman of the Board of Trustees of the consolidated University of North Carolina, President William C. Friday of the consolidated University of North Carolina System, President A. Hollis Edens of Duke University, and Norman A. Cooke, chairman of Duke's Board of Trustees. The foundation hired George L. Simpson, a sociology professor at UNC, as its executive director. He and Elizabeth Johnson Aycock, his office manager and secretary, were the first two full-time employees of the committee. In 1957 Hodges and Simpson approached Karl Robbins, who had sold off extensive textile holdings in North Carolina and retired to New York, and asked him to begin to create a development suitable for the RTP. Robbins agreed and authorized Guest to purchase or buy options in the middle of the Raleigh-Durham area. The land was primarily infertile farm acreage and young pines. Robbins incorporated a company called Pinelands, of which Guest was president. However, few people bought stock in the company; moreover, by 1958 several state leaders began to feel uneasy about using the resources of the state universities to promote a for-profit endeavor. In August 1958 Hodges met with Archibald "Archie" K. Davis, Hanes's successor at Wachovia, to consider the next step, and Davis suggested that the enterprise be turned into a nonprofit venture. Hanes and Hodges agreed, and Davis embarked on a whirlwind tour to raise money to buy out Pinelands and fund the creation of the Research Triangle Institute (RTI), an independent nonprofit contract research corporation established by the three universities but operating under separate management with separate facilities, staff, and board of governors. By the end of the year Davis had raised nearly $1.5 million, and by early 1959 the creation of the RTP, under the control of the nonprofit Research Triangle Foundation, was announced. George Herbert, lured from Stanford Industrial Park in Palo Alto, Calif., was named head of RTI, which began operating on 2 Mar. 1959. By year's end, five organizations were either located in the RTP or were constructing facilities to move there. In 1962 the U.S. Forest Service became the first federal tenant. Any doubts about the park's success were dispelled beginning in 1965, when International Business Machines (IBM) and the National Institute of Environmental Health Sciences announced plans to establish operations in the RTP. In time, professional associations such as the American Association of Textile Chemists and Colorists, Instrument Society of America, and International Union of Pure and Applied Chemistry and Underwriters Laboratories, as well as banks, restaurants, and other service organizations, joined a growing list of organizations settling in the RTP. RTP industries have remained remarkably diverse, with several large, long-term occupants representing the health and pharmaceutical sciences, information technology, microelectronics, biotechnology, and environmental sciences. By the 2000s several foreign firms had operations in the RTP. Other federal agencies such as the National Center for Health Statistics and the U.S. Environmental Protection Agency also had RTP facilities. The UNC Center for Public Television moved into the park in 1989. A prominent occupant of the RTP since 1978, the National Humanities Center-created by a special committee of the American Academy of Arts and Sciences and the Triangle Universities Center for Advanced Studies-attracted some of the world's most distinguished scholars, leading to important books in the fields of history, biography, literature, sociology, politics, and other related areas. In the early 2000s RTP's largest employers were IBM (13,300), GlaxoSmithKline (5,000), Nortel Networks (3,000), and Cisco Systems (2,500). "As RTP Turns 40, the Big Picture Is to Think Small," Raleigh News and Observer, 10 Jan. 1999. Albert N. Link, A Generosity of Spirit: The Early History of the Research Triangle Park (1995). "Research Triangle Park 40th Anniversary-Special Report," Triangle Business Journal, 15 Jan. 1999. Schalin, Jay. "Hard to Reproduce Game Plan of RTP Founders: Unique confluence of time and place made RTP possible" Carolina Journal February 10, 2011. http://www.carolinajournal.com/articles/display_story.html?id=7387 (accessed June 29, 2012). Link, Albert N. and Scott, John T. "The Growth of Research Triangle Park" Small Business Economics 20. 2003. p. 167-175. http://www.dartmouth.edu/~jtscott/Papers/00-22.pdf (accessed June 29, 2012). North Carolina's Research Triangle Park: An Investment in the Future. Directed by John Wilson. 1999. http://vimeo.com/11199745 (accessed June 29, 2012). 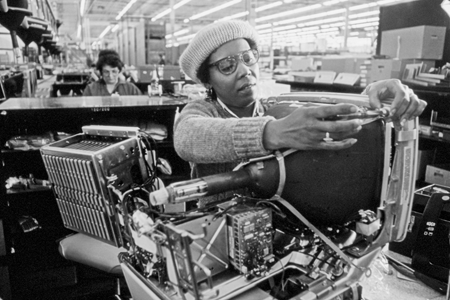 Computer under construction at an IBM production facility in Research Triangle Park, 1984. Photograph by Billy Barnes. North Carolina Collection, University of North Carolina at Chapel Hill Library. Futuristic-looking office and research building completed in 1968 by the Burroughs Wellcome Company (and now owned by GlaxoSmithKline) during a period of rapid expansion in the Research Triangle Park. Photograph courtesy of the Research Triangle Foundation of North Carolina.